Introduce the family’s new addition with our selection of birth announcements, a photo birth announcement is the perfect opportunity to show off your new baby along with all their birth stats. 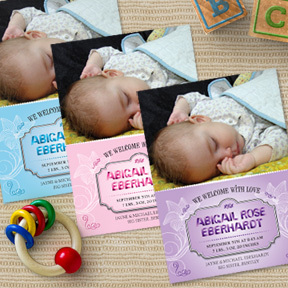 Since Sip and Sees have become increasingly popular, the need for trendy and unique invitations to meet the baby at these events has also increased and our invites are versatile enough for baby boys, girls or multiples. 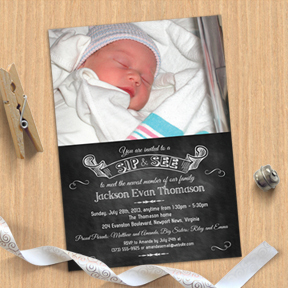 Any of our birth announcements or Sip and See designs can serve double-duty and can be customized interchangeably. Don’t forget to check out our matching images to use as cupcake toppers or favor tags.